Arguably much more important to any PC user than sequential read/write performance is random access performance. It's not often that you're writing large files sequentially to your disk, but you do encounter tons of small file reads/writes as you use your PC. To measure random read/write performance I created an iometer script that peppered the drive with random requests, with an IO queue depth of 3 (to add some multitasking spice to the test). The write test was performed over an 8GB range on the drive, while the read test was performed across the whole drive. I ran the test for 3 minutes. The three hard drives all posted scores below 1MB/s and thus aren't visible on our graph above. This is where SSDs shine and no hard drive, regardless of how many you RAID together, can come close. The two Intel drives top the charts and maintain a huge lead. The OCZ Vertex actually beats out the more expensive (and unreleased) Summit drive with a respectable 32MB/s transfer rate here. 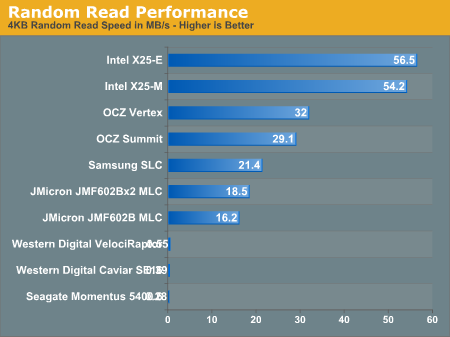 Note that the Vertex is also faster than last year's Samsung SLC drive that everyone was selling for $1000. Even the JMicron drives do just fine here. Read latencies for hard drives have always been measured in several ms, but every single SSD here manages to complete random reads in less than 1ms under load. Every single drive other than the Intel X25-E, X25-M and OCZ's Vertex is slower than the 2.5" Seagate Momentus 5400.6 hard drive in this test. 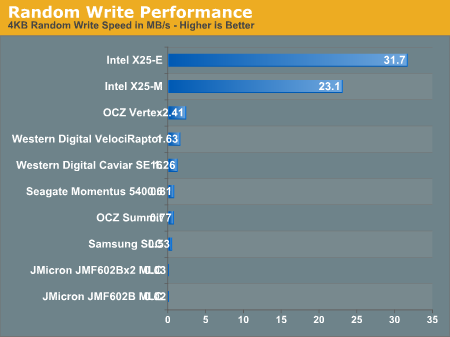 The Vertex, thanks to OCZ's tweaks, is now 48% faster than the VelociRaptor. The Intel drives are of course architected for the type of performance needed on a desktop/notebook and thus they deliver very high random write performance. Random write performance is merely one corner of the performance world. 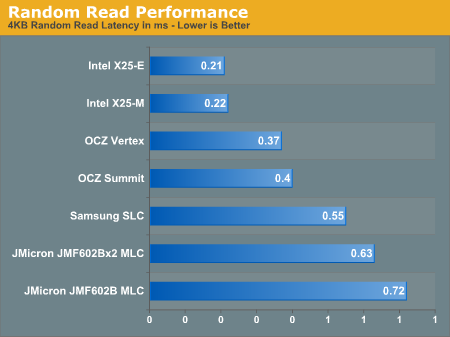 A drive needs good sequential read, sequential write, random read and random write performance. The fatal mistake is that most vendors ignore random write performance and simply try to post the best sequential read/write speeds; doing so simply produces a drive that's undesirable. While the Vertex is slower than Intel's X25-M, it's also about half the price per GB. And note that the Vertex is still 48% faster than the VelociRaptor here, and multiple times faster in the other tests. Great article. Experienced the same thing while using musically on my pc with blustacks emulator device. The hard drive failed. I recently made the exchange of my HD for an SSD and greatly improved the performance, I highly recommend the exchange.